The Behringer Eurolive VP2520 PA Speaker features a professional PA speaker with two extremely powerful 15 Inch long-excursion drivers. Behringer's Eurolive Series of PA speakers gives professional quality sound, massive amounts of power as well as key features, at a cost far below so-called high end PA systems. 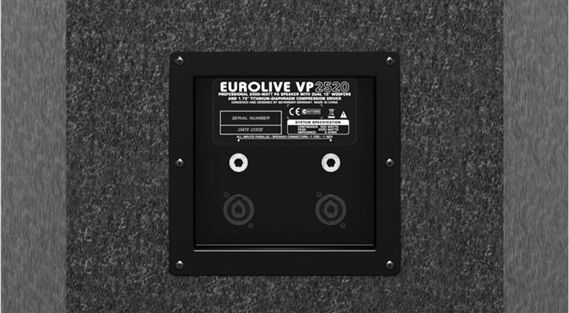 Eurolive PA Speakers have long-excursion drivers for massive acoustic power and titanium-diaphragm compression drivers for great high-frequency reproduction. I recently purchased a couple of these Behringer EuroLive and they are AWesome, especially since I OWN a behringer nuke 6000 and it powers them so good, I definitely recommend them.. Behringer All the WAY..
Nice speaker boxes, sounds great! Nice speaker box! Sounds good & has a warm low-end sound! A complete wall of amazing sound! Used these for the first time with my new Behringer PMP6000 for a corp DJ/Sound gig even though their main use will be for live sound with my band. Such a complete and wide presentation of sound on all styles of music and even simple voice only announcements. Lets just say I am thinking of "NOT" getting a set of separate sub-woofers. Also the highs are so crisp, tight and clean. So glad I went with these. I purchased 4 of these for live sound and DJ applications. I have used them once with the band. They sounded great. Plenty of low end and with the 1 3/4 horn, the mids and highs really cut through in the mix. You cant get a better speaker for the price. Hooked up for a show, good lows, not real low but enough to enhance the music, great crystal clear highs.